Delphos St. John’s High School won three state girls championships in four years and nearly made it four in a row for Coach Fran Voll. The Bluejays were unbeaten in winning the Class A title in 1976-77 and had won 48 straight when they lost to Springboro, 66-64, in the 1977-78 Class AA championship game. They came back to win a AA crown in 1978-79 with a 26-0 record. Although four senior starters had graduated, St. John’s repeated in 1979-80 by defeating Lafayette Ridgewood for the AA championship. Linda Rabe, a senior in 1979-80, played on all three title teams. Row 1, L-R: Fran Voll, Head Coach; Debbie Wiechar, Manager; Laura Grothouse Ulm, Nancy Niekecken Raasch, Cindy Holdgreve Kostoff, Cindy Grothouse, Manager; Sandi Miehls, Mike Klaus, Trainer. Standing, L-R: Sara Link Bowers, Shelly Schnipke Obermeyer, Sue Youngpeter Hohenbrink, Deb Elwer Lindeman, Jeanne Arnzen Gulick, Linda Pabe, Roseanne Luersman Hoersten, Jeanette Wrasman Roberts, George Adams, Principal. 1977 (24-0) – Three years after the St. John girls furnished their own shirts and played with numbers constructed with tape, they had an unbeaten season that ended with a Class A state championship. Led by the scoring and rebounding of sophomore Deb Elwer, the Bluejays thwarted a second-half comeback by Arcanum to beat the Trojans 57-51 in the semifinals and then whipped Mansfield St. Peter, 60-41, for the championship. Front Row, L-R: Patty Adams Hardesty, Sue Youngpeter Hohenbrink, Deb Elwer Lindeman, Jeanne Arnzen Guilick, Laura Grothouse Ulm, Janet Ebbeskotte, Janice Lucke Smith, Diane Wilhem Kill. Top Row, Standing: Ann Metzner, Linda Rabe, Kellie Clark Saine, Sandy Shumaker Young, Trainer Anne Bertling, Sue Youngpeter Laudick, Judy Wegesin Rable, Fran Voll, Head Coach; Marcia Wagner McNamara, Trainer Cindy Reindel Grothouse, Manager Deb Wiechart. 1979 (26-0) – After moving up to Class AA in 1977-79 and losing the state championship game, the Bluejays vowed to return to Columbus in 1979. They kept their promise, taking a 24-0 record into the semifinals and crushed Chagrin Falls, 70-35. Then they knocked off defending champion Bishop Hartley of Columbus, 57-53, for the title. Ohio Player of the Year Deb Elwer scored 23 points and was named MVP of the tournament. Jeanne Arnzen and Sue Youngpeter also made the All-Ohio first team. Bottom row: Diane Wilhelm Kill, Janice Lucke Smith, Linda Rabe, Marcia Wagner McNamee, Janet Ebbeskotte, Kelli Clark Sine, Ann Metzner. Middle row:: Leann Schlagbaum Giese, Patty Adams Hardesty, Sandy Schumaker Young, Susan Youngpeter, Diane Ebbeskotte Wilson, Mary Ann Stemen Swartz, Mary Lee Lause Reichenbach. 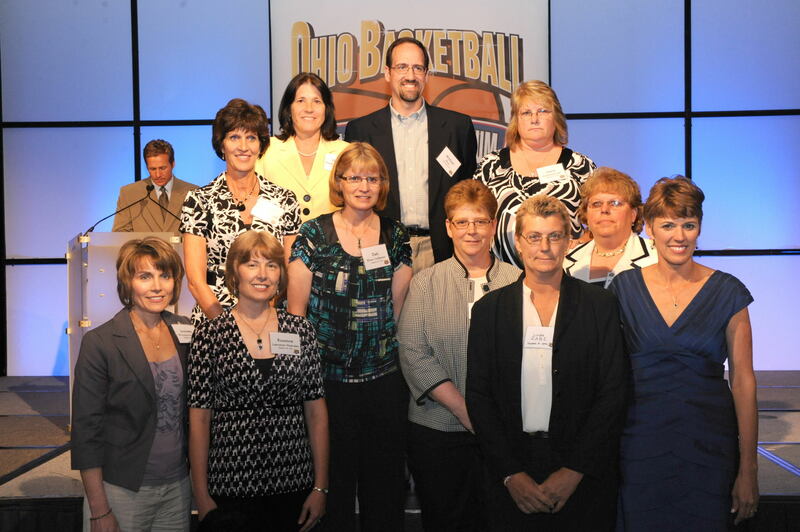 Back row: Elaine Wilhelm Gerding, Jon Jester, Manager; Lana McGue Lorenzen, Jean Kramer Weber, Assistant Coach; Karla Rupert Miller, Fran Voll, Head Coach. 1980 (26-2) – If anyone overlooked St. John in 1979-80 because it had lost five seniors, it was a mistake. A new cast of Bluejays got through the regular season with only a pair of losses to Findlay and then cruised through the tournament to successfully defend their title. St. John smashed Lafayette Ridgewood, 62-41, in the championship game. Kellie Clark was voted MVP of the state tournament. St. John’s had a four-year record of 100-3.